The Tarp Report: Why do these shoes feel so tight? If I'm limping a little bit today, it's because I'm wearing Ethan's shoes. I took my 6-year-old dress shoes to the repair shop on Friday. They still look fine, except that some of the stitching is coming out. The shoe guy said they'll be ready tomorrow. 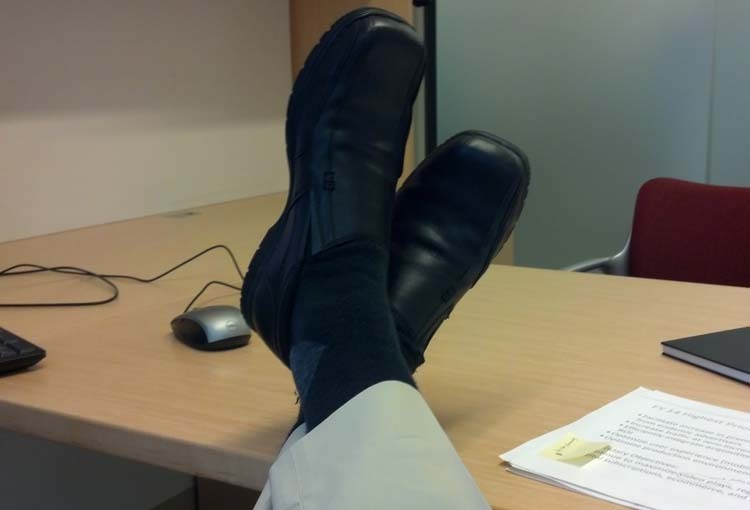 When I got home I realized that I'd thrown away my back-up, 13-year-old pair of dress shoes in the fall because I hadn't worn them in the past 6 years. I'd also thrown away my 10-year-old casual buck oxfords because I hadn't worn them in the past 6 years either. I've found that the best way to need something you haven't used in 6 years is to throw it away. So last night I frantically rummaged through the boys' closet in hopes of finding any kind of shoes that would look better at a business meeting than bright red Saucony Triumph running shoes. Samuel's shoes were too big. Ethan's were too small. I went with too small. Red shoes are actually a big fashion accessory at present!! I'm out of the fashion loop, but duly noted.